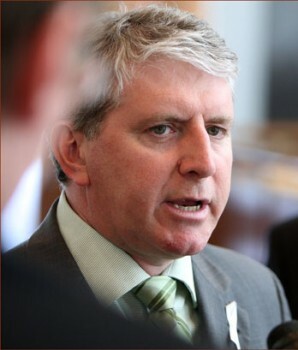 Perhaps seeking a more practical approach to finding common ground with opponents, Australian Home Affairs Minister Brendan O'Connor says that on top of everything else, R18+ videogame ratings will help create jobs. It can be difficult to have a rational debate with people who are opposed to your position on a completely irrational basis. Consider the painfully drawn-out and still-ongoing process of bringing an R18+ videogame rating to Australia. The vast majority of Australians are in favor of it, the system as it currently stands is a demonstrable failure and the rest of the world has managed to implement "mature" game ratings without tumbling into anarchy, yet a small but very vocal core of opponents has been able to hold up the process for years. Some recent progress has been made but it's very slow going, so perhaps it's O'Connor's intent to grease the gears a bit by talking about the issue from a different angle. "An adult classification for video games will provide better guidance for parents and remove unsuitable material from children and teenagers," he told students at the University of Ballarat. "It will also create further opportunities for Australian computer game developers, distributors and retailers. We want to create opportunities for our young people in diverse parts of the economy." "The games industry is an increasingly important part of our creative economy that we should support," he continued. "When making their decision, I urge state and territory governments to consider the value of the computer gaming industry to Australia's economy, as well as the need to provide better guidance for parents and greater protection for young game players." Concerns about the growing economic impact of the videogame industry may not resonate with the average gamer but it is likely to be more relevant to non-gamer opponents of widened classification than things like artistic freedom and the right of adults to make their own decisions. Remember "it's the economy, stupid?" It's kind of like that; an appeal to pragmatism that will hopefully change a few minds and finally get things moving.